When I started working at my photography, I found plenty of technical resources to learn of metering, depth of field and focal length selection. When I wanted to improve my composition and framing, it was a different story. There was plenty of lore, hand-waving, a nod to the “rule of thirds” and the advice to “look at a lot of good photos,” but little in practical tips I could use. 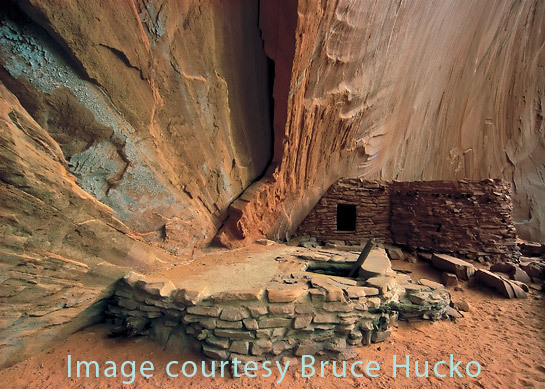 Moab-based photographer Bruce Hucko has a new book out chock full of photos I admire. Time Among the Ancients is his meditation on the mosaic of life as seen through the archeological sites of the Colorado Plateau. I know I like Bruce’s compositions, but why? In Defiance House, I see a converging series of leading lines. They don’t point absolutely to the entry to the kiva, but as a whole, they subtly lead the eye to the unknown, the sacred element of the scene. The darker structure stops the eye, the second window aligns with the kiva entry, repeating the entry motif. Even the ridge of rock at the right, which could be a problem, has been turned into a feature, redirecting the eye back into the picture. Move the tripod 6 inches in either direction, and the composition would be radically different. Would Bruce agree with my analysis of his picture? Maybe, maybe not. Does it matter? Once I see it, good composition is relatively easy to describe. No special skills are required to sketch images, you can even trace over them if you want. The trick is training the visual creative mind to stop describing the actual subject and to see the structure of the two dimensional image. A few pleasant hours with your favorite photography magazines, a pile of scrap paper and a pen can help you improve your ability to see composition in the field. Thanks to Bruce for permission to use his image. The book is an absolute bargain at $7.95, and you can get Time Among the Ancients from the Canyonlands Natural History Association bookstore. The use of my photo on your blog turned out pretty well! I, of course, would have much to say about how it works..that’s my thing! The underlying design, compostion, gestalt of why some photos work better than others is an area of study that more photographers need to …well, study. A lot of casual photographers work on the surface, making photographs of things and places they like with little regard for how the photographs actually work as visual images. Oddly enough and I may get some comments on this…..many photographers are visually illiterate…….or at least suffering from a lack of study in the area of basic design. I encourage all to take a basic 2D design course, an art course or a painting course. Their language is our language and it’s good to know how to speak the language of 2-Dimensional art. It’s not so much pixels and D-76 as it is Line, Design, Shape, Balance, Form, Weight, etc. You’ve analyze the work pretty much as I would have. 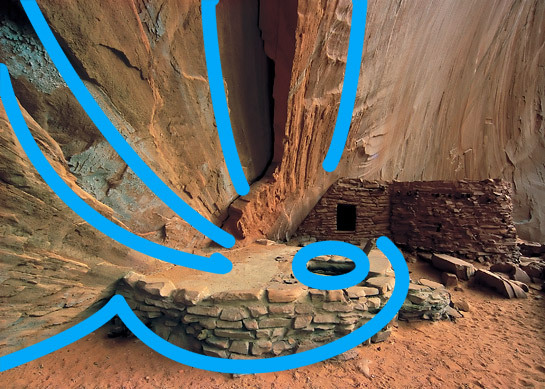 The strong vertical lines draw us down to the top of the kiva and eventually the opening…. The curved blue line around it’s base was good for you to see. It acts like a bowl, holding the downward sloping lines from going any further (or acting in reverse as steam/spirit rising from the bowl). The quiet ground under the kiva is simply neutral. The material to the right is relatively neutral as well. The dark building behind the kiva is a visual counterpoint to the kiva and it’s weight (by color) helps balance the strong and brighter and lighter lines on the upper left. Not to be forgotten are the quieter lines in the upper right that slowly ripple ones eye into the frame. I like making visually dynamic photographs. Some speak louder than others but they are all based on an underlying structure or design that is embedded in the objects being photographed. Composition is the act of placing those elements in the frame and IN RELATIONSHIP TO EACH OTHER so they can work their natural, 2-dimensional, artful magic! Readers of your blog might want to read Rudolph Arnheim or Richard Zakia’s Perception and Photography. A trip to the local library’s art section will give you plenty of books to read. That’s so cool. It shows again that the eye isn’t a chip and vision isn’t a camera. (1) Eye movements flow to targets of interest in saccades. Some basic saccade images and a cool piece of code (GAFFE) that predicts saccades in natural scenes are at the Bovick / Cormack lab at UT Austin. GAFFE was developed by Umesh Rajashekar, now in Eero Simoncelli’s lab … one of the leading labs in natural scene statistics and computational vision. And even while jumping around with saccades, the CNS uses smooth “image updating” to build an illusion of a coherent scene from these patches. You never really see all of a picture at once, even if you think you do. (2) We evolved in the JJ Gibsons’s optic flow field (not to be confused with optic flow in computational image synthesis) and our brains expect and demand a horizon and center of visual space … all the time. The brain creates flow from the periphery to the center, even for static images, because it expects it. Put 1 and 2 together and every image has flow kinetics. Busy eyes, too many centers = bad, smooth curves, dark interesting centers = natural. BTW, the link to Time Among the Ancients in the last paragraph is broken. The first one earlier in the article works. I teach digital photography and use a Smart Technology interactive white board to illustrate many photographic techniques but most specifically composition.